Three times I’ve visited it, and each time I’ve been overwhelmed. 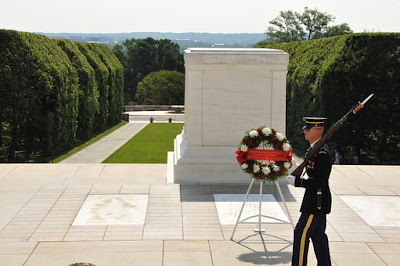 The Tomb of the Unknown in Arlington National Cemetery houses the bodies of three unknown soldiers. Initially, the remains of a soldier from World War I were placed there. Later, officials added an unknown soldier from World War II. Soldiers from the Korean and Vietnam Wars came later. Officials later removed the one from Vietnam because he was identified. Watching the changing of the guard moves one’s emotions. No one talks. The only sounds are the guards’ heels clicking, rifles snapping, birds chirping, and perhaps a distant bugle playing Taps at a burial. God assigned Moses the monumental task of leading more than one million people out of slavery, across a wilderness, and into their Promised Land. Moses wanted to know who God planned to send as his assistant in this huge task. God assured Moses He would go with him and that He knew him by name. I’m known by a lot of people, but not by all. And many who know me I don’t know in return. Perhaps they’ve seen my picture by a poem, devotion, or article I’ve written. Having others know me is comforting, but, more than anyone else, I want God to know me. God creates every person and knows us all by name. No birth escapes His notice because He manufactures each one. Regardless of whether a person comes to know God, God knows them. God desires for all to know Him, not just know about Him. Through faith in Christ as our Savior and by His forgiveness of our sins, we know God. We can know His mind—His will for our life. Not only does God know our names, but He also knows our hearts . . . our thoughts . . . our emotions. He sees every detail of our lives and wants us to involve Him in it. We can’t hide anything from Him—nor should we want to. When I know God as He knows me, I can accomplish His will and plan for my life—which is why He placed me on earth. Doing God’s will enables us to live life to the fullest. Don’t miss out on knowing God. Be who He created you to be. Tweetable: Are you missing out on knowing the most important person? Prayer: Father, we believe You know us intimately. Draw us into that same type of relationship with You so we can do Your will on earth.